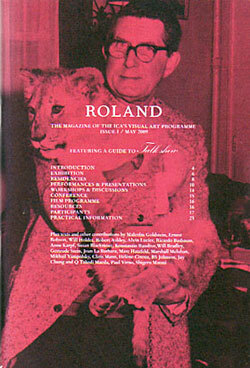 The inaugural issue of Roland, a new(ish) format magazine is produced alongside Talk Show, a month-long season of artworks and live events that addresses the act of speech. Talk Show is curated by Will Holder with Richard Burkett and Jennifer Thatcher. With texts and contributions from Will Holder, Robert Ashley, Alvin Lucier, Ricardo Busbaum, Anne Kerpf, Susan Blackmore, Joan La Barbara, BS Johnson and others.